You’ll start with your Microsoft Account or MSA. 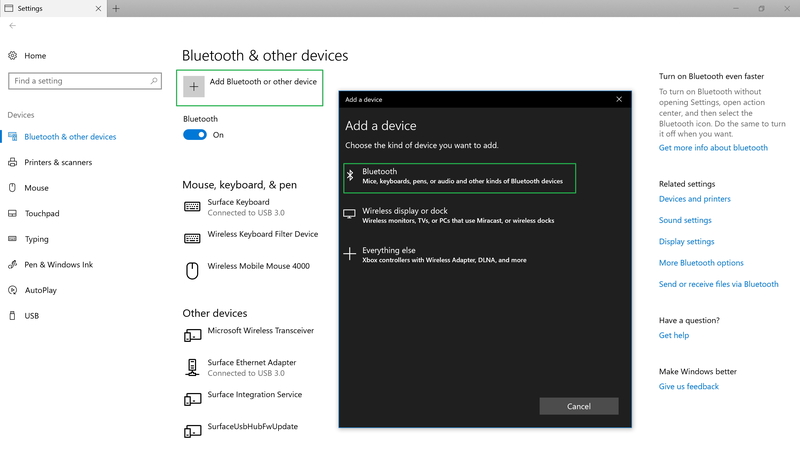 What’s a Microsoft Account, you ask? A Microsoft account is a way to sign-in to services provided by Microsoft through one username (email) and password, whether you're playing video games, or chatting with friends on Skype. Go check out Everything You Need to Know About Microsoft Accounts before you read any further! 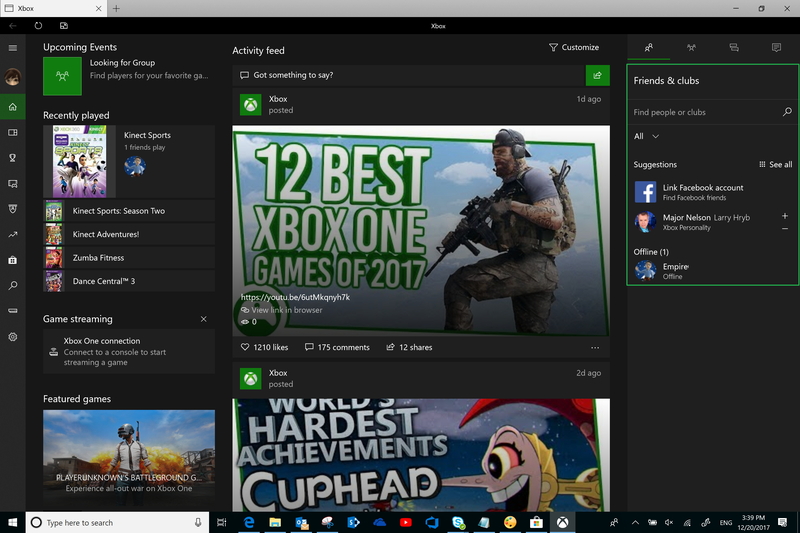 When you’re signed in to your Microsoft account, all your gaming activity, such as scores, achievements, video or still captures of your finest moments, friends that you play with often, and the games you own will be at your fingertips. All that information is easily accessible in the Xbox app, which is available for Windows, iOS, and Android. The first time you sign into the app, or an Xbox console, a gamertag will be generated for you. A gamertag is your username, an online alter-ego if you will, that represents you in gameplay. 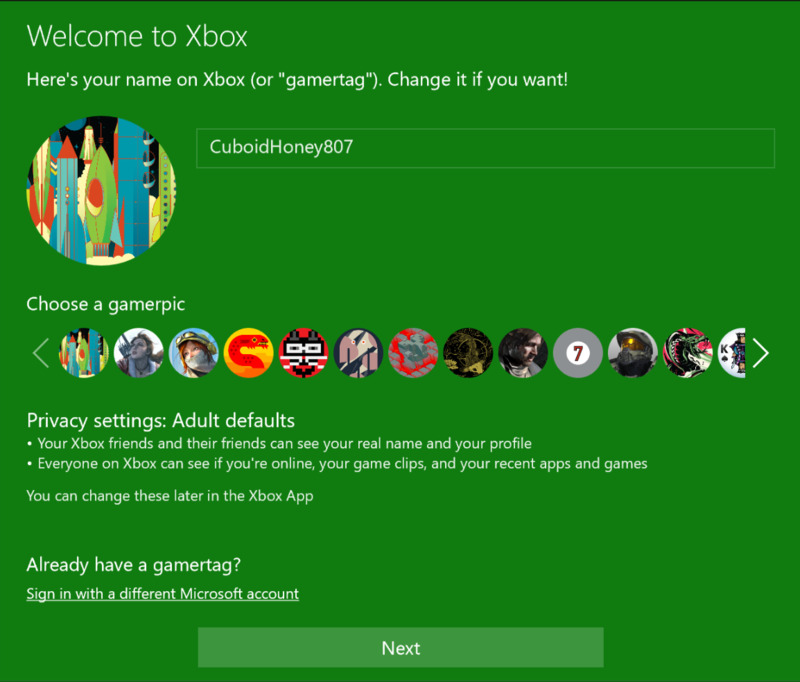 The auto-generated gamertags can be very silly, so if you’re not a fan of CuboidHoney87, you’re free to create your own. Make sure you like it though, because once you choose a gamertag, you cannot change it for free any more. Don't go alone, take a friend! Once you have your account in order and personalized to your liking, you can start connecting with your friends and do some gaming! Your dashboard will look something like this. If you’ve never signed into the Xbox app or an Xbox console with an MSA before, you’ll be adventuring solo until you begin looking for some friends. In the image below, you can see the search bar for Friends & Clubs. Simply type the name or gamertag, if you know it, of a friend in the search bar to see if they are gaming on Windows or Xbox. You can also link your Facebook account to your MSA to find your Facebook friends who are gaming on Windows or Xbox. Once you’ve found some friends to share in your new gaming adventures, you can start searching for games to play – either on your own, or with your friends. 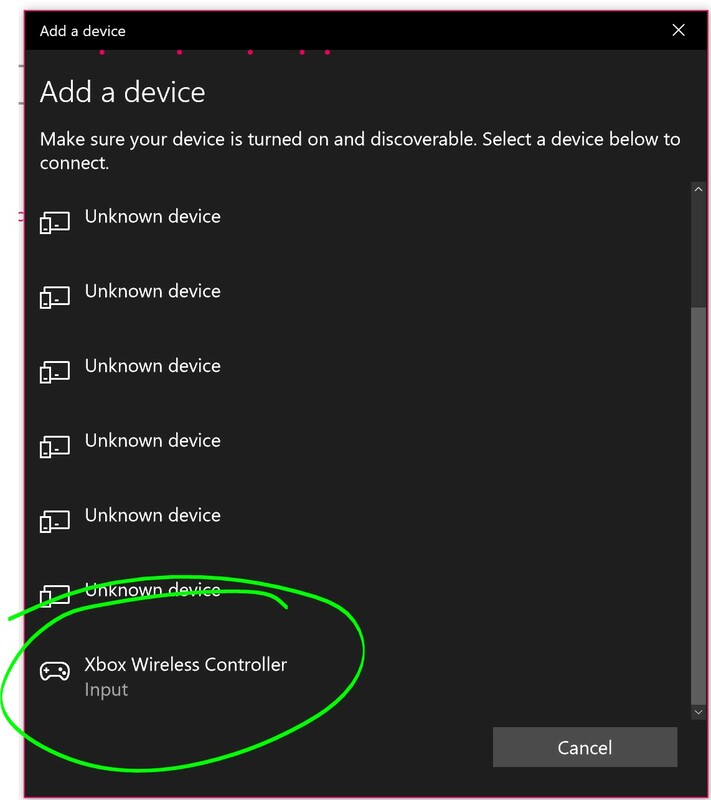 You can do that in either the Microsoft Store, which is always available on your taskbar, and within the Xbox app as well. The icon looks like a shopping bag with 4 squares on it. 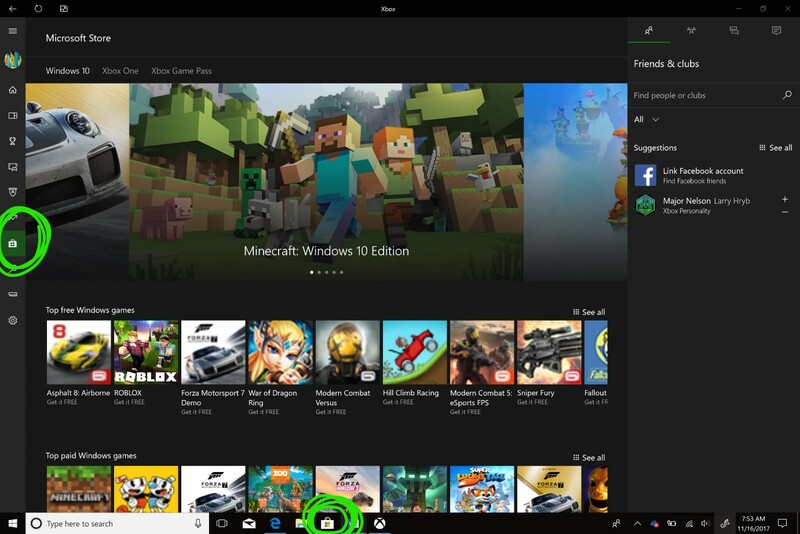 In the Xbox app, simply navigate to the icon on the far left that looks like a shopping bag (highlighted in green below), and you can begin browsing hundreds of free and paid games for Windows and Xbox. Be sure to select the appropriate platform in the top navigation bar. If you want to play on your PC, choose Windows 10. Note that you can purchase games from the Xbox One section on a PC, but you will only be able to play them on Xbox unless they say Xbox Play Anywhere, which means you can play them on your PC as well as your Xbox. 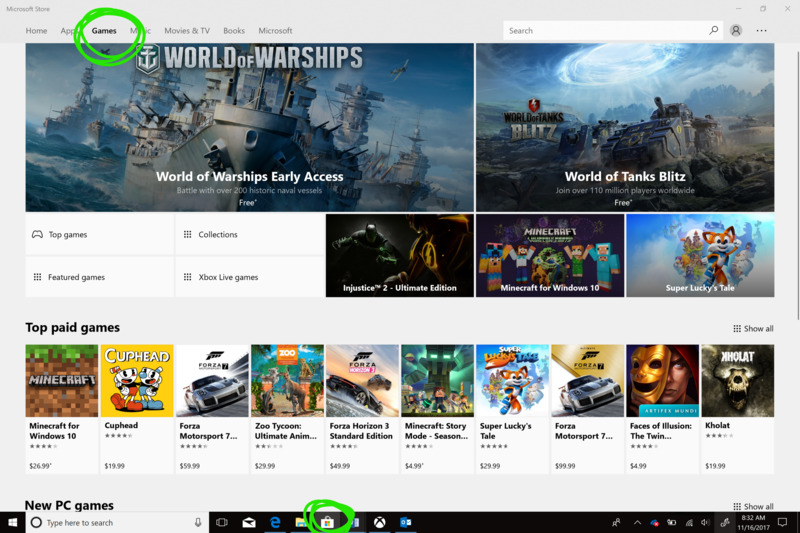 You can find the same selection of games in the Microsoft Store app. Much like choosing which mall you prefer to visit, where you go to buy games is simply a matter of personal preference. The PC game selection is the same in either location. You can access the Microsoft Store app by selecting the icon in the Taskbar that looks like a shopping bag with the Microsoft logo on it. If you have removed that icon from your Taskbar, you can simply search “Store” in Cortana’s search bar in between the Start menu and the Taskbar. Once you have opened the store, select Games from the top navigation menu. You can browse the various curated collections of games. You’re almost done! Once you decide that you’re ready to fire up a game and begin a new adventure, the only steps that remain are deciding how you’ll play. You can also use your keyboard and mouse to control the game. Each game will have its own unique set of keys and clicks that correspond to actions in the game. Those are typically found in a tutorial you can play through, or a menu item like Help or Settings. Now you’re ready to play. The hardest part will be deciding which game to play first!